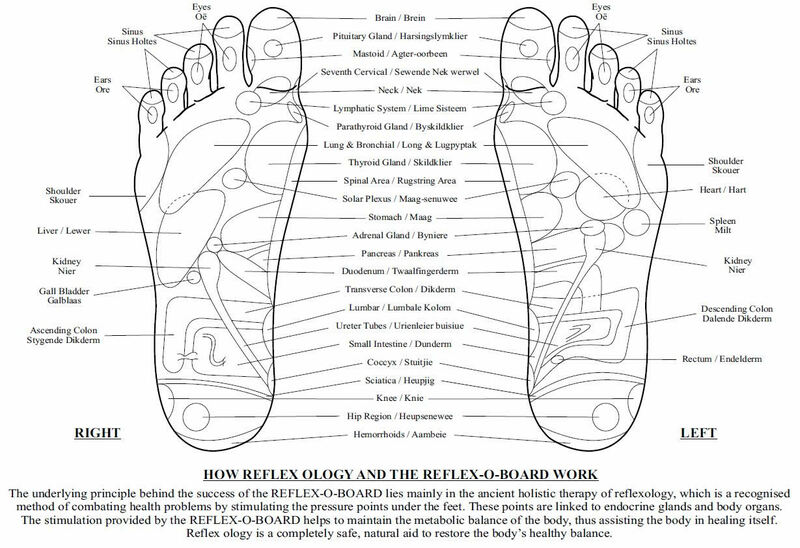 How does the Reflex-o-Board work? Thousands of microscopic capillary vessels converge in the feet. The smallness of these vessels, together with the effects of gravity and restrictive shoes, cause impurities to block them. By stimulating circulation, impurities such as uric acid crystals and calcium deposits are removed, improving conditions such as swollen feet, varicose veins and other circulatory-related ailments. The nervous system is the master-controller of the body functions. It also plays an important role in all higher mental processes such as thinking and memory. 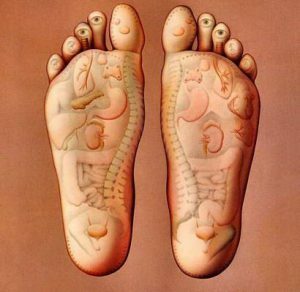 Under the feet there are thousands of nerve endings. Vigorous foot massage stimulates those which have become sluggish through stored impurities, allowing the communication system between the brain and all parts of the body to function more efficiently. Lymph fluids are used by the body to fight germs and disease. Stimulating the pressure points under the feet which relate to the lymphatic system helps to improve the immune system. Simply walk randomly on The Board for 10 – 15 minutes per day at a rate of approximately 2 steps per second, covering the entire surface of The Board. Pressure points under the arches should be stimulated by occasionally walking with toes or heels off The Board. Curling the toes every now and then allows The Board to stimulate the pressure points in the tips of your toes, especially if you suffer from migraines or headaches. DRINK A GLASS OF WATER WITH EVERY SESSION TO HELP THE BODY FLUSH OUT TOXINS. HOT WATER IS PREFERABLE FOR HEADACHE RELIEF. THINK GOOD, POSITIVE THOUGHTS WHILE TRAMPING AWAY THE PROBLEMS. Discuss with your practitioner before commencing. Use The Board twice per day, but start gradually, possibly with a towel over The Board and 2 or 3 minutes duration progressing to the full period as you feel comfortable. It will suffice to use The Board every second day. Tender Feet? Unless you are used to walking on rough surfaces, the initial experience will be uncomfortable until your feet toughen. Lay a towel over half The Board and walk on this periodically to lessen the sharpness, gradually progressing to full barefoot treatment. What can be more natural than walking barefoot? Your feet are accustomed to your own weight. Walking on The Board therefore exerts optimum pressure, but never hesitate to contact your practitioner if you are in any doubt. Always ensure your board is on a non slippery surface, especially if you use it in your shower. You Can use The Board while eating, reading, watching T.V. or while standing and working at one point e.g. ironing or washing-up, but those positive thoughts are important. Scrub with a brush, soap and water. It is Important to stand erect and Breathe Deeply and evenly while Walking on the Board.